Deal to drive profitability and reduce capex for combined entity, say analysts. At present, Indus Towers is jointly owned by Bharti Infratel (42%), Vodafone Plc (42%), Aditya Birla Group (11.15%) and Providence (4.85%). MUMBAI: Bharti Infratel, the tower unit of telecom services provider Bharti Airtel, expects to complete its merger with Indus Towers in the first quarter of the next financial year starting April 1. The company's management, in an analyst meet, also talked about the new growth areas, which include fibre sharing, small cells, data centres and WiFi off loading, for the combined entity. The “deal is expected to be completed latest by April-May 19”, Bank of America Merrill Lynch said in a report later. Analysts said while the merger might drive profitability and lower capital expenditure for the combined entity, the benefits would be limited. “We believe the two companies already operate on a large scale and had practically no overlap in terms of areas of operations. Hence, merger benefits will be marginal,” said Edelweiss in its report. Infratel’s shares closed Wednesday 2.6% lower at Rs 290.75 on the BSE, where the benchmark Sensex rose 0.6%. The merger to create the largest tower firm in India is awaiting regulatory approvals from the National Company Law Tribunal and the telecom department. Analysts expect Bharti Airtel and the parents of rival Vodafone Idea, who will co-own the merged entity, to bring down their stakes in the tower firm. “Bharti and Vodafone will have equal governance and management rights in the merged entity with no lock-in, which should pave the way for eventual independence,” said UBS in its report. The brokerage added that the merger was expected to be 14-16% accretive to earnings per share for Infratel, along with improvement in capital structure and return ratios. Last year, Bharti Airtel, Aditya Birla Group’s Idea Cellular and the Vodafone Group agreed on the merger of privately owned Indus Towers and listed Bharti Infratel to create the largest mobile tower operator in the world outside China. 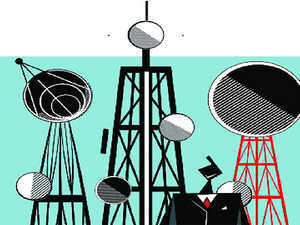 It is estimated to have 163,000 towers, covering all of India’s 22 telecom service areas. Idea and Vodafone India later merged to form Vodafone Idea. At present, Indus Towers is jointly owned by Bharti Infratel (42%), Vodafone Plc (42%), Aditya Birla Group (11.15%) and Providence (4.85%). After the merger, Bharti Airtel and UK’s Vodafone Plc are set to hold 37.2% and 29.4% stakes, respectively. While the Aditya Birla Group is expected to hold 7.1%, it is likely to cash out. Infratel’s management is optimistic that growth of mobile data could lead to demand for additional tenancy, which in turn will add to opportunities for the tower firm. “Management expects strong mobile data growth to lead to tenancy demand. Demand could come across macro towers for coverage and densification in the near term, and through small cells over long term,” said Credit Suisse in its report. Analysts of the brokerage firm also highlighted the company management’s estimates that the top three telcos (Vodafone Idea, Airtel and Reliance Jio Infocomm) would cross 300,000 tenancies each from the current 180,000-220,000. In the longer term, the combined entity will see multiple new growth opportunities: fibre sharing, small cells, data centres and wifi offloading, among others, the management said. Its strong balance sheet position would be handy for inorganic growth into these opportunities. The Sunil Mittal-led tower company is also mitigating pricing risk arising from renewal of a large chunk of tenancies between fiscal 2020 and 2023, by offering telcos similar master services agreement terms, provided that the operators renew at least 33% of tenancies expiring in any given year for a period of at least five years, said UBS. Brokerage firm Jefferies estimates that pressure would continue on tower firms as telcos remain under stress. It also expects “margins to see a gradual moderation as increments and loading charges are negotiated”.